As schools break up in mid July, thousands of families flock to the sunshine. In the Mediterranean, with temperatures topping 30°C, you may want to be within easy reach of the sea or a swimming pool. But there are other options too, including long haul adventures. If you’re travelling with kids, see our recommended family holidays in July. If you’re travelling by yourself, see the best singles holidays in July. Note: all the travel companies featured are personally recommended by our editors. Cyprus can get very hot in July. The 30ºC temperature quoted is an average, but it can get higher than 35°C. Fortunately, it’s easy to cool off at the beach or pool. Check out this range of lovely hotels. The resort of Paphos is particularly attractive. Also consider: Crete, the most southerly Greek island (30ºC). 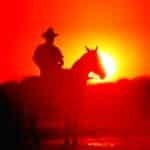 It’s well worth braving the heat to enjoy this fascinating and beautiful destination. The Turquoise Coast of Turkey adjoining the Aegean Sea is as beautiful as it is hot in July. 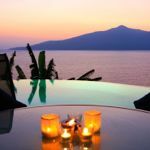 We recommend staying away from the biggest resorts and head for a charming small resort such as Kalkan. To get even further from the crowds, escape to the unspoilt Bozburun Peninsula. This is an inspiring collection of hotels and villas in the area. Also consider: if you’re active beach bunnies, try Mark Warner’s new Phokaia Beach Resort where sailing, windsurfing and waterskiing are all included. See more holidays in Turkey. Corfu is a lot further north than Crete and Cyprus – flights are shorter and tend to be cheaper – but it’s actually hotter in July. 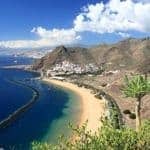 The island has some grim concrete-and-chips resorts, but head to the north east corner and you’ll find a charming region with gorgeous villas. If you want somewhere even quieter, take the ferry to Paxos, which is an absolute stunner. Again, staying in a villa is the best option. Also consider: Kefalonia in the same island group is another gem. It was the setting for Captain Corelli’s Mandolin. See more holidays in Greece. The Cote d’Azur of France gets busy in July, but that’s part of the fun: see and be seen. If you have money to spend, rent a villa in the hills around St Tropez. If you’re on a tight budget, stay at an upmarket campsite with Siblu Villages. If you’re with a big group it can work out good value to rent a chateau with pool. Also consider: if the Cote d’Azur is too hot, how about the south west of France where Limoges is around 25°C and Bergerac around 26°C. Find more holiday ideas in France. It’s only a short flight to the Balaeric Islands – Mallorca, Ibiza Menorca and Formentera – but hot temperatures and sunshine are all but guaranteed. Much-maligned Mallorca has some superb countryside and beaches as soon as you leave the package resorts. Again, it’s the villas we recommend. 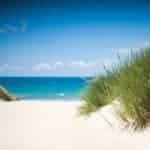 Menorca is great for families, especially those with young children – see these places to stay. Ibiza has some stylish boutique hotels. Also consider: exploring the coast and countryside of Catalonia (28°C) or the pristine sandy beaches and pine forests of the Costa de la Luz (30°C). If you want cooler temperatures, you’ll love unspoilt Northern Spain. See more holiday destinations in Spain. The city of Naples is captivating but it can swelter in July. We recommend you head out instead to soak up the timeless beauty of the Amalfi Coast staying in a wonderful hotel such as the Miramalfi in Amalfi or Bellevue Syrene in Sorrento. If you want beaches with your countryside, head to Puglia in the deep south of Italy. Also consider: the Italian Lakes where temperatures will be considerably lower, ideal for sightseeing as well as sunbathing. Find more holidays in Italy. Croatia continues to grow in popularity as holidaymakers discover the beauty of its coastline and its more than 1,000 islands. One of the best bases is the historic city of Dubrovnik but another exciting option is to stay on a crewed boat. Sail Dalmatia has a great selection of gulets, motor sailers, catamarans and traditional yachts. Also consider: the clean mountain air of the Alps. It’s a great time to visit with lots of outdoor activities, sparkling lakes – and it’s cheap. Check out Inghams for families and Peak Retreats for budget places to stay. Bermuda is glorious in July: warm and sunny but not unpleasantly humid. You can spend long days lounging on pristine pink sand beaches, visiting local attractions by boat and perhaps playing a round of golf. 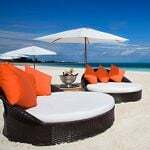 Our recommended hotels include Cambridge Beaches and the family-friendly Fairmont Southampton. If you’re on a budget, Grotto Bay Resort is great. Also consider: the Caribbean is heading towards hurricane season but you should still find fine weather in July. See our recommended Caribbean holiday ideas. 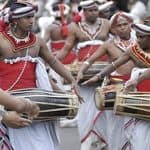 Although it can be wet on the south-west coast of Sri Lanka, the picturesque east coast will be enjoying excellent weather. 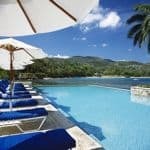 Check out the boutique hotels and eco resorts and this incredible range of unique holiday experiences. It’s not just about beaches. Also consider: the flights are long, but if you love islands and beaches, both the Cook Islands (25°C) and Fiji (26°C) are sensational. Montreal is a buzzing chic and cosmopolitan city that really comes into its own in summer. 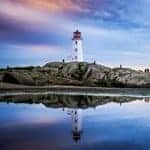 Spend a few days there then encounter icebergs in Newfoundland or head to New Brunswick for caviar tasting, whale watching, rugged coastline and islands. Join an escorted tour or self-drive adventure. Also consider: Japan for another combination of city, coast and countryside. Tokyo reaches 29°C in July. Mid haul destinations – Morocco, Egypt, the Middle East – may sound promising, but temperatures in July verge on the ridiculous. Cairo hits 35°C, Marrakech 36°C and Dubai a huge 41°C. If you want to get out of Europe, the best bet is to go long haul. Both Madagascar and Mauritius can be rainy in July and, like much of South East Asia, Thailand can be troublesome. Popular resorts such as Phuket and Khao Lak on the Andaman coast tend to be wet, but if you cross over to the Gulf Coast you’ll find the island of Koh Samui enjoying long days of sunshine and temperatures of 31°C. Get more ideas about where to go on holiday in July, and July honeymoons.